Three cirques, an active volcano, aquatic canyons, lava tubes and more! Dwarfed by its westerly neighbour Madagascar and far less well-known to travellers than its sibling island Mauritius, the tiny island of La Réunion rises like a jagged green jewel from the blue of the Indian Ocean. It’s probably France’s least-known "départemente" but expect it to become more popular as its awesome GR routes, its volcanic cirques, its cascades and canyons and Creole architecture and lifestyle become more well-known. We were drawn to the idea of travelling to La Réunion originally by the alluring promise of its active volcano, Piton de la Fournaise, but a quick round of research rapidly revealed a host of other treasures to discover. We needed little persuasion to turn the idea into reality. So, what's so special about this place? How can an island that measures barely 50 miles by 30 have so much to offer? Well, they don't call it "L'Ile Intense " without good reason. Arriving at the small but busy airport of St Denis, you're instantly struck by the sheer grandeur of the landscape. The Route Nationale that circles the island alternatively clings desperately to the coast, huddled against immense cliffs, and shears through swathes of sugar-cane plantations. Heading inland, the only way is up - sharp waves of rugged volcanic rock, many cloaked in dense rainforest vegetation, rise like great shark's teeth ahead of you. Cascading down amongst these vertical walls and gigantic ravines are thousands of shimmering waterfalls. The overall effect is simply breathtaking. Piton de la Fournaise itself is deservedly popular as a volcano. With its central cone rising picture-perfect from a frozen lava lake in a caldera some 100m+ deep, it's a true classic. 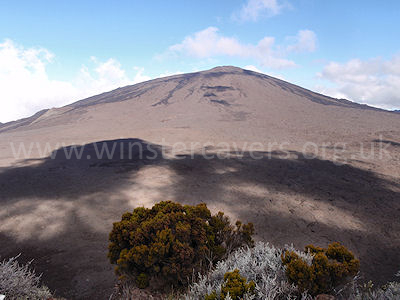 The enormous, collapsing Dolomieu crater and the smaller Bory are majestic in their own right, and the authorities have at the time of writing closed the path to the summit to the general public for safety reasons. A paradise for nature lovers and serious walkers, the island, being French, is blessed with a well-maintained and well-signposted network of GR "Grande Randonnée " routes. It's possible to walk from one end of the island to the other, or to combine any number of sections of the various paths, to create your own very special walking itinerary. We chose to undertake the four day walk in the Cirque du Mafate as detailed in the Lonely Planet guide, along with a number of day walks including one from Grand Ilet to Belvedere la Fenetre, another from Hell Bourg to Belouve, a shorter, easier lakeside stroll around the lovely Grand Etang, and a superb full day's circular route from Cilaos that included visiting the Cascades Bras Rouge and the Bassin Bleu. There are a few lava tunnels and caves, mostly of little significance, but the Grotte de la Grande Ravine (discovered in 2004) is an unusual exception. Difficult to access (it can only be reached by an interesting series of abseils followed by an exposed rope traverse to one of the two entrances), it is home to a sizeable colony of cave-dwelling birds - salanganes, or swiftlets. The exit from the cave is even more spectacular than the approach – an 82m pitch down the vegetated face of the cliff is followed by an airy rebelay on a tiny ledge to drop another 86m to the river bed below. Not for the faint hearted, this one! La Réunion is famous for its beautiful canyons. The impressive and vertiginous Grande Ravine mentioned above is just one of these – and unusually for La Réunion, it's dry except when the heavy rains arrive in the summer, when it would most definitely be out of bounds. We undertook our trip to the Grande Ravine with M'Ric and Sébastien of canyoning specialists Ric a Ric. As a complete contrast to the Grande Ravine, we spent an unforgettably wet and wild day in the truly spectacular canyon of the Fleurs Jaunes, close to Cilaos, with Philippe of Cilaos Aventure. Breathtaking silvery-white cascades pour down the vertical grey throat of this wonderful canyon that faces the magnificent jagged peaks of Piton des Neiges, La Réunion's highest peak, with the climax of the excursion being the two big abseils of 55m and 36m respectively. The return route is in iself an adventure; a Via-Ferrata style ascent eventually tops out on a sharp arête with great views of the canyon you descended. For more information, take a look at our canyoning in La Réunion page, or the photo galleries of the Grotte de la Grande Ravine or Fleurs Jaunes canyon. La Reunion is covered by a set of 6 1:25000 IGN maps, showing all of the GR hiking routes. We found the St. Denis map the most useful by far, as it covers the Cirque Mafate area, but aqcuiring the full compliment will aid planning enormously. We travelled at the end of La Réunion's winter season (early to mid September), which is officially "cool and dry ". That means it's very pleasantly warm during the day but not too hot to undertake an energetic walk. The temperature does, however, plummet at night; at 5am on the day we left the Gite du Volcan, the car windscreen was solidly iced-up! We were fortunate enough to get excellent visibility most days and encountered virtually no rain. In the summer, it's a different story. 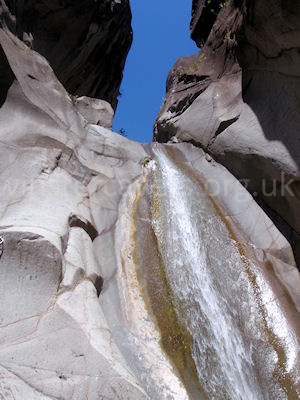 Catastrophic flooding and cyclones can make rivers and paths impossibly dangerous to navigate, and "chutes de pierre " (stone shoots) and rockfalls can happen frequently and without warning. Take heed of warning signs – this is no nanny state. Mosquitoes were only a problem on one occasion (on the return from the Grande Ravine), but it's worth taking plenty of mosquito repellent and, of course, high SPF sun cream – better safe than sorry! And vegetarians beware – you'll need to explain very specifically what you are and are not prepared to eat. If you simply say you’re "végétarienne " you’ll be served "poisson " as the so-called "veggie " option. You're likely to get blank looks for a while if you explain you don't eat meat or fish, but once the Réunionnais realise you're actually serious, they'll usually be very accommodating, if a little confused as to what to cook for you. If you're vegan, you're likely to have a very hard time indeed. Other activities and opportunities on La Réunion are almost limitless. You can dive in coral reefs or swim with dolphins, undertake some serious "VTT" (mountain biking), soak up the sun on tropical beaches, surf, paraglide, go sea kayaking or climbing – or you can just enjoy the food, the atmosphere, the architecture, the ubiquitous séga music, and the very special culture of the island. With so much to choose from, it's difficult to find time to do everything you want. We had only a fortnight, and it wasn't nearly enough despite the fact that every day was filled with adventure and discovery. Somehow we did manage to find time to fly over the island in a 2-seater light aircraft (highly recommended), to sit on a palm-fringed beach and watch whales peacefully roaming the ocean, to take a boat trip to see dolphins close-up and to visit the superb aquarium at St Gilles-les-Bains. We also met a host of wonderful people with whom we shared time on our travels, all of whom contributed in their own special way to make this one of our very best travel experiences.